ECOCORP provides fully-automated plants for the anaerobic composting of green waste, food waste, and paper in combination with dewatered sewage sludge and/or animal manure and industrial/construction waste. Our custom designed plants range typically in size from 20,000 to 100,000 tons per year. Plants may be either ECOCORP or customer owned and operated. We offer under license commercially proven European technology to minimize risk. The standard ECOCORP facility has an organic waste processing capacity of 50,000 tons per year. It requires one acre of industrially zoned land and provides a fully contained operation with respect to emissions of odors, air or water pollutants to the neighboring environment. The 50,000 tons of incoming waste are comprised of commercial wastes, including demolition lumber and gypsum waste as well as separated green wastes, food wastes and non-recyclable paper and dewatered sludge. The commercial wastes are presorted at the facility to remove recyclable paper products such as corrugated cardboard, plastics and metals as well as non-recyclable plastics. The usable organic waste is converted into a number of commercial products including: bio-methane as an alternative motor fuel; a high quality, pathogen free compost as a soil conditioner and fertilizer supplement or fertilizer partial substitute; carbon dioxide as an industrial gas with a variety of uses; and gray water as a replacement of fresh water for irrigation, street sweeping and other applications. The compost is post processed mechanically to remove undesirable ingredients and is sold in bags and in bulk. Ø 85,000,000 scf of natural gas equivalent - 95% bio-methane content - to be used as a renewable, ultra low emissions, alternative motor fuel (650,000 gal diesel equivalent or 720,000 gal gasoline equivalent). Ø 50,000,000 scf or 2,800 tons of high purity, i.e., 99.99%, liquefied carbon dioxide to be used as an industrial/commercial gas. Ø 18,000 tons/yr of high quality ECOTEX™ soil conditioner with an average 2-2-2 nitrogen, phosphorous and potassium content, pathogen free and seed free to be used as a fertilizer supplement or a fertilizer replacement. Ø 1,600,000 kWh of electricity to supply all the power needs of the facility. Ø 7,000,000,000 Btu of process heat comprised of hot water or low temperature and pressure steam to supply all the heat needs of the facility. Ø 650,000 ft3 net of gray water to be used for irrigation and other purposes. Ø 3,000 tons of recyclable metals, paper and plastics; about 4,500 tons of non-recyclable plastics and wood with a high heating value that can be used as feedstock for power generation; and about 1,000 tons of waste to be landfilled. Ø Maximizes the benefits obtained from processing the solid wastes and minimizes the impact on the environment. 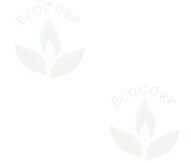 ECOCORP sells the highest quality compost. Since it is processed at continuously monitored elevated temperature, it is free of pathogens.